Charlize Theron lays down an amazing performance with a character that just gets pushed over into hopelessness. Javier Bardem also puts in an Oscar-worthy performance as a doctor who’s always risking his life to save others to the detriment of his own life. Once upon a time, there was a two-time Oscar award winning actor who not only was an actor but a director as well. This Actor/Director was also very big into trying to change the world through activism roles, not only in films but also in real life. This Director - let's just for the sake of putting a name in place call him Sean. So Sean decided he wanted to shine a light on the horrors of West Africa and decided to tell the story through a romance. Sound almost as crazy as starting a review with Once upon a time? That's because it is! 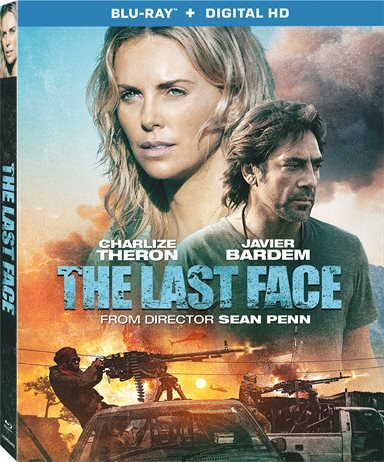 Out this week is the new flick directed by Sean Penn (Into The Wild) The Last Face which stars Charlize Theron & Javier Bardem. The only way to explain this film is it's a romantic tragedy. Basically the story revolves around Wren (played by Academy Award Winner Charlize Theron from Monster, Mad Max: Fury Road and most recently Atomic Blonde), who is the Director of Doctors of the World and her romance with Dr. Love (Played by Academy Award Winner Javier Bardem from No Country for Old Men and most recently Pirates of the Caribbean: Dead Men Tell No Tales). Wren meets Dr. Love in 2003 in West Africa where he is a dedicated physician trying to help the impoverished people in war torn towns. She, of course, falls hard and as all relationships go, there are difficulties! Now the plot of this story is pretty weak. While the romance is supposed to be the center of the story and the thread that winds you through to the end, it clearly isn't what is most important. The true focus of The Last Face is the war torn areas of Africa and the horrifying things they have to deal with on a daily basis. Knowing full well the atrocities of what's going on in Africa, Sean Penn pushes it so hard into the forefront of the story that it obliterates the romance completely, and not in a good way. I know what he was trying to do. He was trying to show just how bad things are in these areas of Africa and how there is much work to be done. But the problem is, while there are violence and suffering, it's mainly about random people that we have no back story for. In fact, the film keeps shifting from these tragic events to and even sadder romance as if that's supposed to lighten the mood. I always look at a film as a storytelling medium. If you don't make people invested in characters before they die a tragic death, don't expect tears to be shed. Don't get me wrong! We all know there is suffering going on in the world. In real life, you shouldn't have to know someone's life story to be sad hearing they died tragically but if you want that kind of impact DON'T intertwine it with a romance. Just go balls out and make a hard-hitting documentary. Also, I would love to talk about another issue I have with this film, and much more that seem to be coming in at a fast and furious pace (see what I did there). Editing timelines that jump all over! Note - some stories you can actually tell straight forward and keep our attention!! The Last Face starts at the end and goes back in time but from there it jumps forward and backward at will and at times it's quite hard to tell if it's the present or 10 years back. If you are spending time trying to figure out where in the story timeline you are, you're wasting energy and not getting emotionally connected. In a world where Hollywood is dictating the world's attention span, it would be refreshing to actually see a story play out in chronological order already. While most of "The Last Face" seemed incredibly frustrating, and at times just so damn dark, there were moments of fantastic acting by all involved. Charlize Theron lays down an amazing performance with a character that just gets pushed over into hopelessness. Javier Bardem also puts in an Oscar-worthy performance as a doctor who's always risking his life to save others to the detriment of his own life. The thing that upsets me the most about "The Last Face" is that I know all those who worked on this project had the best intentions in doing it. Theron, being from South Africa herself, and Penn have both been activists trying to make a change not only in Africa but all around the world. I think the intentions were right but the main storyline and editing just killed it. The Blu-ray is presented in 1080p AVC with a transfer that looks amazing. The picture is sharp and clean, and colors are spot on. The audio, presented in DTS-HD Master Audio 5.1, unfortunately, does not fare as well as the video. Most of the times the dialog is drowned out by the special effects and the overpowering soundtrack by Hans Zimmer (The Dark Knight). Aside from the film itself, The Last Face also contains a Digital HD copy of the film and a ten-minute featurette entitled, Picturing THE LAST FACE, which showcases real life events horrific events in Africa that contributed to the creation of this film. "The Last Face" is dark, bloody and in your face, the worst of what's going wrong in Africa, with a romance (out of place) on the side. It had potential with impactful imagery and great performances, but not enough to save face! Download The Last Face from the iTunes Store in Digial HD. For more information about The Last Face visit the FlickDirect Movie Database.